Berries.. in particular Strawberries and Whipped Cream, can it get better than that?? Wash the Strawberries and pat them dry with a kitchen towel. 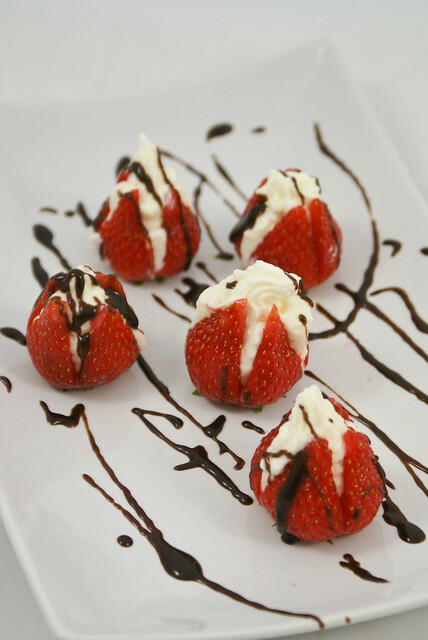 Make sure that the strawberries sit flat, if not cut the green stems off the strawberries so they will stand upright when served. With a small sharp knife, cut an “X” in each strawberry, cutting almost to the bottom of each strawberry. Make sure not to cut it till the end, if you do the strawberry comes apart. 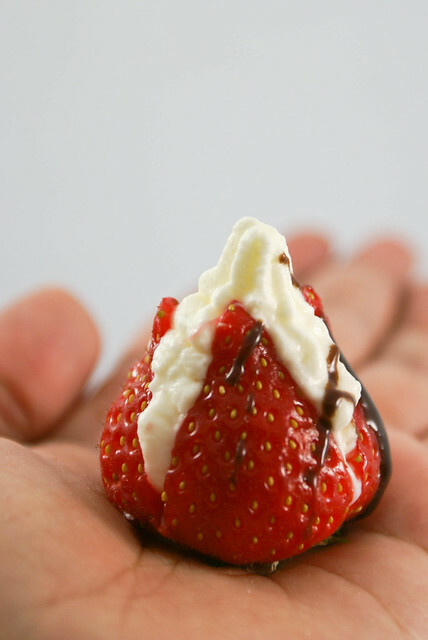 Gently with your fingertips, spread each strawberry apart to make “petals”. Now make the cream filling. In a bowl whip the mascarpone cheese and whipping cream until soft peaks form. Add the sugar and vanilla and continue to whip until stiff peaks form. Spoon the cream into a piping bag fitted with a large tip. Pipe the cream into the strawberries. Place in the Refrigerator for 30 mins and serve cold. Drizzle with Chocolate Sauce if you like. These look so delicious, I would have a hard time trying to keep from eating them before serving them. Nothing like fresh strawberries and cream. Thanks for sharing these sweet appetizers-yum! So beautiful and very yummy strawberries !! I'm hosting a giveaway @ my place.